When using pdfaPilot in the Enfocus Switch workflow system pdfaPilot Server/CLI has to be installed on that system. When an existing version pdfaPilot is updated, Switch won't automatically update the path to the pdfaPilot Server/CLI application. 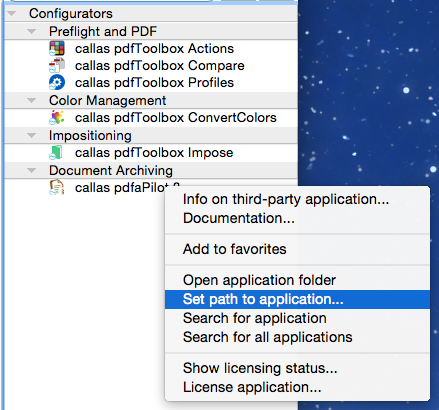 In order to adjust the path, you have to select the pdfaPilot Configurator element and click on "Set path to application...". Then, set the path to the CLI Version in the file system dialog shown.